Attention freaks and geeks, this baby connects to another device and delivers sequencer control over parameters that respond to expression pedals or CV generators like oscillators, filters, delay parameters you name it. Set your tempo with the Rate slider or Tap Tempo footswitch, or sync to a drum machine or DAW via MIDI clock. Six Tap Tempo Divide modes provide rhythmic diversity. This thing is a tweaker’s delight! 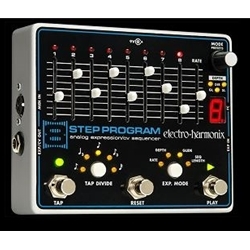 You can add the optional 8 Step Program Foot Controller expands that to 100 presets!